I have to admit it I love NFL single season records. Whenever I play Madden on my PS2 or Wii I only consider a season good if I break an NFL record, such as rushing yards or passing yards. Playing on a console however is not reality, however Drew Brees the New Orleans Saints quarterback is real (trust me I saw him for real at Wembley Stadium earlier this year) and he has a chance to break a record that has stood since 1984 – Dan Marino’s 5,084 yards passing in 16 games. Brees needs 402 yards against the Carolina Panthers on Sunday to break the record that has stood for almost a quarter of a decade. Carolina have only given up 300+ yards passing in one game in 2008 (375 yards v Kurt Warner’s Arizona Cardinals). The Panthers also have the #11 ranked pass defense (by yards). With Deangelo Williams on fire and rookie Jonathan Stewart an excellent backup (who has slowed down towards the end of the season) the Panthers will in my humble opinion spoil the Brees ‘5085’ party. If Brees does get 402 yards it will be a minor miracle. He does have an incredible supporting cast with Marques Colston, Lance Moore, Devery Henderson (bad hands good speed), Jeremy Shockey, Billy Miller and running backs Pierre Thomas and Deuce McAllister and even Aaron Stecker and Mike Bell. 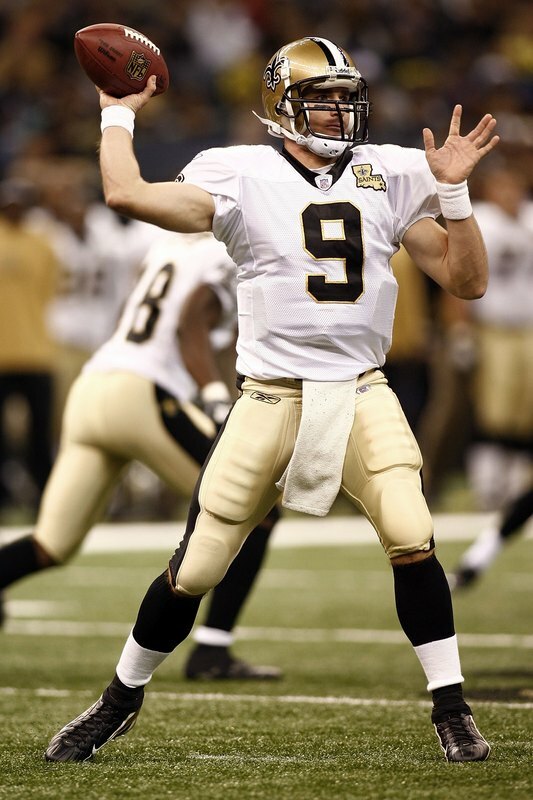 He does have a bloody quick release, but I think it will be lack of time of possession that will eventually kill off Brees attempt at the record. My prediction – Brees gets 273 yards and two or three touchdowns passing but he throws one costly interception and ultimately fails to get the record. Blame the Panthers running game for not giving Brees enough time. Merry Christmas everyone who has read my blog in 2008 – It has been a pleasure and an honour to have you read my words.